I recently asked them about what oil I should use to dress my protection spell candles. Their recommendation, based on the kind of magical work I do which incorporates Wicca but is Christian-based, was for me to keep it simple: hyssop in olive oil. Based on Scott Cunningham’s recommendations in his must-have book The Complete Book of Incense, Oils and Brews, I put 7 drops of hyssop essential oil in 1/8 cup of olive oil and swirled it in a clockwise direction until it was mixed together. I use this not only on my candles but also as a protective anointing oil for myself. 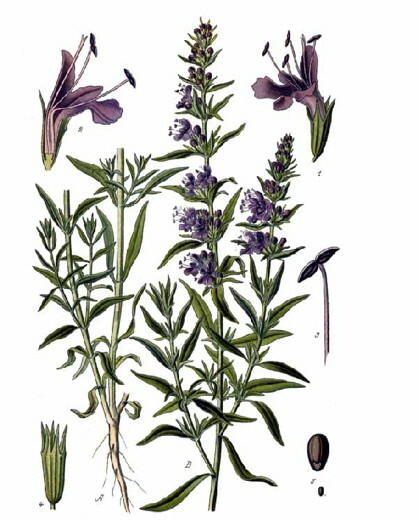 Hyssop is the most widely used purification herb in magic. Paul Beyerl, in A Compendium of Herbal Magick, says “There is probably no herb better suited for physical cleaning of one’s temple, ritual tools or even robes. The easiest method is adding some liquid extract to your cleaning water. Hyssop also makes a superior bathing herb, bringing purification to the spiritual, emotional and physical selves.” Others suggest that hyssop can be used in spiritual healing to drive away evil and negativity and to also protect the healer. The use of hyssop goes back to the Egyptians who used it for religious purification. The priests ate this herb with bread in order to purify it and make it suitable for their strict diet. Hyssop was also used by Greeks and Romans with its name coming from the Greek word USSOPOS meaning “holy herb.” Hyssop was eventually incorporated into the Christian tradition. It was often planted in monastery gardens and was used in the ritual cleansing of churches. Now for the controversy! The hyssop that is explored in this post is NOT the hyssop mentioned in the Bible. The original Hebrew word is EZOV and early Jewish commentators identified it with za’atar which also has aromatic and cleansing properties. Other scholars say that EZOV is the caper plant which the Arabs call azaf. The caper plant is native to the area and is also considered to have cleansing properties. The reason for the confusion is that the Septuagint (an early translation of the Hebrew Bible into Koine Greek) translates EZOV as USSOPOS. Since both herbs have cleansing properties, it’s easy to see how the misidentification arose. Early English versions of the Bible took their cue from the Septuagint and called the herb hyssop in both the Old and New Testaments. After examining extensive evidence on the subject, I’m inclined to believe they are two different herbs. This entry was posted in Herbology and tagged Christian, Herbs, Hyssop, Pagan, Wicca. Bookmark the permalink.